Tough, modular and economical, refurbished shipping containers are recyling on a large scale. Shipping containers are made to withstand some serious abuse. They're loaded full of heavy freight on one side of the planet, hoisted via crane and stacked on top of each other, then transported across rough oceans. They're dropped onto trucks, trains or barges and carried to their destinations, where the process begins again. So if you're looking for a tough, modular structure to use as a hunting lodge, look no further than steel shipping containers! We acquire them from the shipping industry and modify them into comfortable, compact houses that can be carried in one piece and placed on a foundation in the most remote of locations. Our modification process includes weatherproofing and insulation, fenestration, electrical, plumbing and mechanical systems, and finishes. They are delivered complete and ready to be lived in. 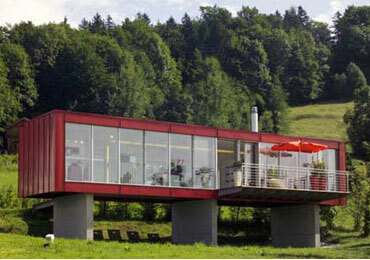 Why a shipping container conversion?